It's a bit of a tricky one, this. I understand completely that three young Chinese girls died and over 180 people were injured in the recent Asiana Flight 214 crash at San Francisco International Airport. I wouldn't want this post to draw attention away from them or their families at such a painful time. But the naivety of the Bay Area TV station, KTVU, beggars belief and deserves to be highlighted. Thanks to Jon C who sent it in. The station received confirmation of the names of the four South Korean people who were in charge of the plane from an official at the National Transportation Safety Board. Presumably the people at the station were only too keen to broadcast the scoop and clearly didn't look twice at the copy. KTVU also failed to remember that the NTSB never reveals such information. 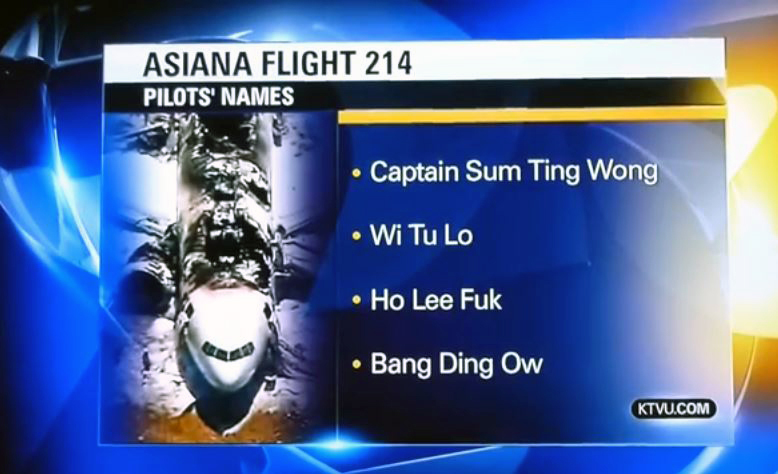 Later, a press release from the NTSB announced that the names had been confirmed by a summer intern who 'acted outside the scope of his authority when he erroneously confirmed the names of the flight crew on the aircraft'. Still, KTVU fell for it, Huk Ly Nansinka.